As a DIASPORADICAL publicist, cultural organizer and social entrepreneur, Nati "conrazón" Linares creates visibility for the world's wildest creators and disorganizers who are dedicated to rebalancing the world. Raised in Staten Island, New York City by a hard-working mother and father who were born in Cuba & Colombia, respectively - she is a digital nomad splitting time between the Coasts (and when she's lucky, hemispheres!) with her base in New England. Nati passionately connects hearts to minds and edges to center with her big mouth and open eyes. A diosa with a decade in the music business working with artists from Manu Chao to Bomba Estereo to Los Rakas to Zuzuka Poderosa and festivals like NYC's SummerStage, Santiago de Cuba's MANANA and the Afro-Latino Festival of New York City, she's worn various hats as a manager, producer, publicist, organizer, promoter and more. 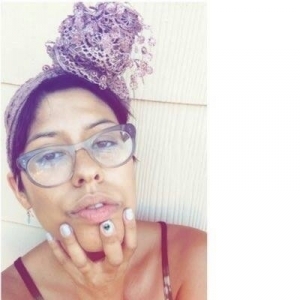 She is also a proud collective member of Sacramento, CA's Sol Collective, a center dedicated to arts, culture and activism. This experience has led her to start an arts collective in her hometown of Staten Island, NYC called ISLA, which co-founded local programming via, La Isla Bonita Summer Festival. 2017 and beyond: With her eyes on the future, she's currently the Communications Manager at the New Economy Coalition while taking on select clients for conrazón.